It’s been a nice hot weekend, so you can be pardoned if you missed the news, but the Washington Legislature adjourned without funding the Columbia River Crossing, As a result, both governors Inslee and Kitzhaber have essentially declared the project to be dead. This is viewed by welcome news by various different groups: Conservatives opposed to the expansion of light rail, environmentalists opposed to the expansion of I-5, and good-government types outraged by the gross incompetence which has followed the project for the past decade, as well as the appearance of significant self-dealing by the project team (and a process that appears designed to force a preferred and pre-selected solution), all have reason to cheer. And it is Washington conservatives that we have to thank for killing the CRC (for now), as the Democratic political establishments in Salem, Olympia, and Washington DC were all behind this project, despite the objections from their fellows on the left. But while many on the right are crowing about the outcome–the “crime train” won’t be bridging the moat between Portland and Vancouver, and the two governors were dealt a political defeat–the ultimate winners will likely be progressives, not the Tea Party right. The reason why is after the jump. The first thing that needs to be understood–is that for the CRC, dead probably doesn’t mean dead, as in “no project will ever be built”. A replacement/enhancement to the Interstate Bridge won’t occur for quite a few years; I’m assuming that the federal funds that were being made available will be instead given to someone else. However, the need for a replacement crossing in the corridor still exists–and assuming the US economy doesn’t go into the tank and stay there, future funding opportunities will be available. When, I don’t know–but if and when the region gets its stuff together (and hopefully produces a more reasonable proposal), there will be opportunities in the future. And the demographic realities of the US suggests strongly that the political culture that develops CRC-2 may be more progressive than now. Some of the strongest opposition to the project came from conservative residents of Clark County. Much of this opposition came about due to anti-transit attitudes from the older generation–who associate transit with crime and poverty. These folks are slowly growing old and dying; the young voters replacing them don’t have the same negative attitudes towards extensions of public transit. While I don’t expect that all of Clark County will warm to MAX any time soon, I do expect that in short order, conservatives will no longer have veto power over the project in the Washington Legislature. By the same token, the younger generation tends to have a more libertarian lean and has far less loyalty to organized labor–and is less likely to view construction jobs and other claims of “economic development” as reason to do projects. Construction industry lobbying was a major factor in the development of the current CRC, and while I expect that to continue, I expect to see more scrutiny on such projects. Cultural change within ODOT is also another factor. Over forty years ago, ODOT was formed in a reorganization of the old Oregon State Highway Department, but only recently are we witnessing the agency starting to take its multi-modal role seriously. A decade ago, an ODOT official essentially proclaimed that the agency would block any MAX extension across the Columbia unless attached to a freeway widening. Nowadays, the agency is showing signs that it considers alternative transportation as essential components of its mission, as opposed to add-ons it has to support to get highways built. The bottom line is that the political circumstances that produced the current CRC–a highway megaproject with significant greenwashing–are changing. What a new CRC would look like, I’m not sure–I expect it to be a less ambitious project in any case. It might not even include light rail (though I would expect some rapid transit–possibly BRT–in any case). By killing the project, the next version of the CRC can start off with a clean slate, free from the burden of “we’ve spent all this time and money so we can’t quit now”. And when the project does get revisited, the politics will probably be far less in the favor of the concrete lobby. Time to Support Broadway/Flint/Wheeler Safety Project! Last year I called out the Broadway/Flint/Wheeler intersection as the outstanding presentation in the Traffic and Transportation class. The realization of this effort, in the form of a PBOT project design, is now on the “150% list” for funding in ODOT’s STIP process. The final selection of funded projects will occur shortly. I’m told the deadline for submitting comments is June 30. Specifiy you are commenting on the N Broadway Safety Crossing Enhancement Project in your email. ArrivalStar Patent on the Ropes? A company called ArrivalStar has been making a nice business of suing transit systems claiming rights over technology to display real-time arrivals. In fact, ArrivalStar is the main reason that Portland Transport is organized as a 501(c)(3) – so that if our transit tools generated a legal challenge, we’d have a corporate wall to protect the developers (including yours truly). But that era may be over. The Electronic Frontier Foundation has succeeded in limiting the scope of the patent, and the American Public Transit Association is suing to invalidate it. Last week I wrote about research into likely patterns of bicycle growth in Portland, and complementary transportation and land use choices that would be required. Roger Geller’s analysis also turns to what happens if we don’t get the intended growth in active transportation. 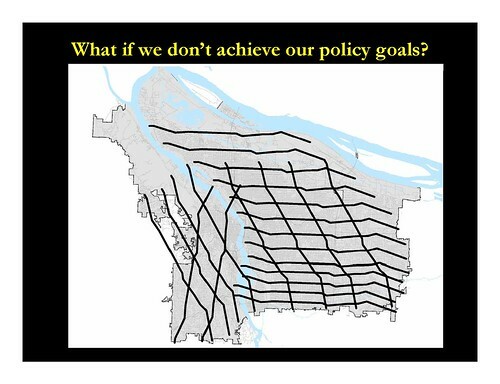 If mode splits stay where they are today Portland will see more than 1 million additional auto trips each weekday by 2035, or as Roger puts it, “23 Powell Boulevards”. So what would that look like? We are not likely to actually construct 23 high-volume arterials, nor are we likely to re-open discussion of additional freeways like the Mt. Hood Freeway. I hope that somebody will actually model this, but my guess is that we would see this as increased congestion throughout the City’s street network. It would be very interesting to take out the model used for the “Cost of Congestion” study and apply it to a projected future state. What is the economic value of avoiding that congestion? The original study used the number $844M annually throughout the region. We could build a lot of sidewalks, bike facilities and transit infrastructure for that! If you look at the TriMet route map, it tends to resemble an amoeba. There are several arms, of various lengths, and lots of connectivity to the core–but in many cases, no connectivity between arms without travelling into downtown, or routes involving multiple transfers. Starting with the St. Helens Road and heading counter-clockwise; there’s a short arm up US30 to Sauvie Island (and connections with Columbia County transit agencies). There’s a big arm in the US26/MAX corridor, going as far as Forest Grove, essentially bounded by the West Hills/US26 to the north and Cooper Mountain to the south. There’s a tentacle (the 94) going from Tigard to King City to Sherwood. Another blob reaches Tualatin, with some service heading to Wilsonville (outside the TriMet district). On the east side, some of the arms are shorter–spurs to Clackamas Community College and the Willamette neighborhood, a long skinny arm out to Estacada, a shorter arm along Sunnyside road–and then one final arm serving areas east of Gresham (but not reaching Sandy; also served by a different transit agency). Unfortunately, for many of these arms, there is no direct transit service between them; travel between points on the periphery generally require going through the core, and often many transfers. Not much detailed text describes this (and no concrete proposals are offered), but many of the lines on the map are interesting, and correspond to (direct) service not presently offered by TriMet. In addition, BRT between Tualatin and Oregon City or Clackamas was proposed in the 2012 TIP. In this article, we look at several potential corridors on Portland’s periphery, and the prospects for service there. Only places within the TriMet district are included–Wilsonville, Clark County, and various exurbs not served by TriMet are not discussed. North Portland-Washington County. We start in the northwest quadrant. An idea that is often suggested (including by myself) is transit service over the St. Johns Bridge and Cornelius Pass, connecting North Portland (preferably the Yellow Line and/or C-TRAN routes) to western Washington County. (PCC Rock Creek and Willow Creek TC are possible termini). The interesting technical question, of course, is whether TriMet rolling stock can safely navigate Cornelius Pass Road. The road is designed to handle large trucks (and many use it), and Columbia County Rider offers service between Willow Creek and Scapoose/St. Helens via Cornelius Pass; but using busses significantly smaller than TriMet’s standard fleet. There is some desire to improve the road’s condition. Washington County has done much revision of their part (which is mostly flat), and Multnomah County has studied improvements extensively, with about $9M in future work funded. Also, ODOT is expanding the intersection with US 30. However, funding is scarce for more significant improvements, and the spectre of a westside bypass looms (I wouldn’t mind at all safety improvements over the route, but I certainly wouldn’t want a freeway through there). Hillsboro to South Cooper Mountain/Progress Ridge. Right now South Cooper Mountain is a bunch of fields, though Beaverton expects to start developing it in a few years (it’s one of two recent UGB expansions). Progress Ridge, just to its east, is already a quite dense, and somewhat uspscale, neighborhood. The transit service there is lousy–a big reason being the geographical isolation of the area, being sandwiched in between Cooper Mountain and Bull Mountain. But this is, more or less, the halfway point between Sherwood and Hillsboro, so this is a connection worth considering. Cooper Mountain itself is likely difficult terrain for TriMet to traverse. Most of the roads going up the mountain have slopes in the 10-14% range, and several of them are not maintained to bus-friendly design standards. A better alternative might be to go around it to the west. Two obvious options are a) Tile Flat, Clark Hill, Farmington, and 209th, which goes right past the other major UGB expansion, South Hillsboro. Or, Scholls Ferry and River Road can be used to reach Hillsboro directly. Both routes are on well-improved roads with no difficult curves or grades. Both routes also involve territory current outside the TriMet service district, however. South Cooper Mountain to Sherwood/King City Sending a bus down Roy Rogers Road, really ought to be a no-brainer. Sherwood suffers from pretty bad transit service–only the 94 to King City and Tigard (and Portland during rush hour, though all-day service to Portland will start this fall). One other possibility, also hinted in the chart above, is sending a bus east on Beef Bend Road to King City, and possibly continuing east on Durham to Bridgeport and/or even Lake Oswego. It is also worth noting that Roy Rogers Road borders a previous UGB expansion known as West Bull Mountain, though one that has not yet been developed. (The amazing thing about that is that Washington County paid for a transportation study of the area; the final report of which not once includes the words “bus” or “transit”). Sherwood to Tualatin An even bigger no-brainer. The distance is short; there are several routes to take, and unlike the first three above (which pass through rural areas), the are between Sherwood and Tualatin is well-developed. Tualatin’s Chamber of Commerce presently provides shuttle service between TriMet and many of the industrial sites along Tualatin-Sherwood Road; this is an obvious candidate for fixed-route transit. Even though the draft SW Corridor proposal on the table ends at Tualatin (a Tualatin-Sherwood segment is not likely to be considered further), the City of Tualatin, in both its recently-updated Transportation System Plan and the Linking Tualatin project, are anticipating future bus service in this corridor. Tualatin to West Linn/Oregon City As noted above, this has been identified as an important transit corridor. The 2009 High-Capacity Transit Plan identifies it as a “Next Phase Regional Priority Corridor”, the 2035 Regional Transportation Plan calls for HCT to reach Oregon City in the medium term, and the 2012 TriMet Transit Improvement Plan (TIP) possible future BRT corridor. (Portland Transport covered this development back in 2011). But even local bus service on Borland Road would be nice and useful. As the Tualatin River is a bottleneck (and I-205 frequently a parking lot), well-designed transit in this corridor can have advantages over driving for commuters. Oregon City to Clackamas Here, there is good news–the service (the 79) is already there. This corridior is also identified in many of the above-mentioned planning documents to be of importance, and is also included in the BRT suggestions. , and its one that has been identified in the TIP as a possible frequent service corridor. Am mainly mentioning it for completeness; also the I-205 BRT corridor mentioned above likely would extend to Clackamas and the Green Line as well. Clackamas to Gresham. Right now, the 155 heads east from Clackamas Town Center on Sunnyside, about as far as 162nd, and turns around. Presently, getting from there to Gresham requires use of a lot of country roads. But Clackamas County is developing a project to make a contiguous 172nd/190th corridor (3-5 lanes) between Gresham and OR212. 190th, when it approaches Gresham, curves back east and becomes 182nd/181st, the principal N/S arterial in the area. Were this to be done, this would be an obvious transit route. One political obstacle is that much of this area is territory that previously withdrew from TriMet, and has shown a tendency in the past to resist any attempt at urbanization. Gresham-North Portland And now we complete the circle. Gresham has many good connections with E/W corridors along the Columbia, including both Sandy Boulevard and Airport Way–but connections to North Portland lack. One big reason is the airport sitting in the way; but most of the lines serving north Gresham, Troutdale, Fairview, Wood Village, or Parkrose end at Parkrose TC–and nothing connects Parkrose TC with North Portland, despite numerous routes to get there. One can use MAX, the 12, or the 71 to transfer to the 72, but the 72 doesn’t serve the more northerly parts of North Portland–in particular it doesn’t connect with C-TRAN or reach St. Johns.